We offer an installation service for the over 50’s. We can advise you before you purchase or help you with your existing TVs & Accessories. Whether you need a Digital Recorder installed, help to get your new Soundbar going, need help accessing some of the latest Streaming Services like Netflix, a complete Home Theatre Installation or want to get that Flat Screen TV on the Wall, Tuned In Cabling Solutions is waiting for your call. Looking for that something extra to help you use all of your TV and Audio-visual Components with ease. Put all of those Remote Controls in storage. Tuned In can setup your iPad as the ultimate Remote. You can have full control of your Media Room or Lounge Entertainment System with a System that’s designed to be easy to use. Specifically set up for your requirements, a System that works with all Brands. 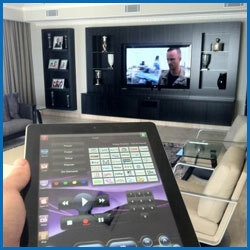 If you can use an iPad or Tablet, you will find this Remote System helps you effortlessly navigate from your Blu-ray Player to Foxtel and all of your other components whilst also having control over all of you audio. All this with the tap of the screen. Please contact us for further information. • Installation of Data Points. Hardwiring provides the best solution. • Installation of Access Points and Wi-Fi Networks. Call us now for an onsite assessment. We have a comprehensive range of Digital Antennas, Boosters and mounting systems to guarantee you crystal clear enjoyable Digital Reception on the Gold Coast. 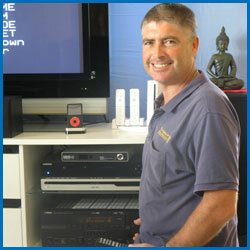 Whether you have just moved into a new house in Upper Coomera or Pimpama, live in a heavily tree location in Tallebudgera or Mudgeeraba, or live in a Unit in a multi-story building in Broadbeach or Surfer’s Paradise, we can provide a solution to get digital signal into your lounge and into your Television. Recent 4G Phone Tower Installations are causing many problems on the Gold Coast at the moment. People are coming home from work to find they have no TV reception. Old Boosters are prone to 4G interference and will virtually shut down when a 4G Tower nearby is active. We have 4G friendly products to overcome these issues. Most houses and units on the Gold Coast are actually positioned in areas where the Digital Signal being transmitted from Mount Tamborine is good. We also have two other Transmitters, Currumbin and Springbrook for areas outside the footprint of Mt Tamborine. Areas like Runaway Bay, Hope Island and Coombabah are flat and the installation of a new Hills Digital Antenna can stop that pixelating and get rid of that No Signal warning on your Television. Broadbeach Waters and Mermaid Waters are also good areas for Digital Reception. Sometimes it’s not just a matter of updating the old antenna for a Digital Antenna and the problem’s solved. 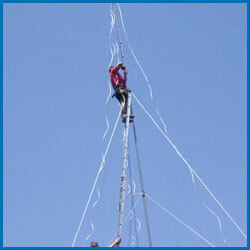 Positioning of the New Antenna is one of the most important parts of the installation. By surveying the roof for TV Signal with a Field Strength Meter, and locating the optimum position for Digital Signal, a far better result can be achieved on a new installation. Even in difficult spots in Tallebudgera Valley and Currumbin Valley a great result can be achieved. A Quality Australian Made Antenna positioned correctly and aimed at the appropriate Transmitter can stop all those nasty dropouts, and make watching your Digital Television enjoyable. For those of you living in multi-story buildings in Biggera Waters, Surfers Paradise, Broadbeach through to Coolangatta and are experiencing problems with your Digital Reception, we can help. Everybody should be able to enjoy Free To Air Digital Television on the Gold Coast. 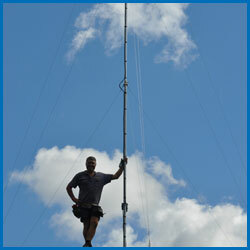 We offer full Re-cabling, and Complete Upgrades of Old Antenna Systems. Contact Tuned In cabling Solutions and we can design and Install a Quality Digital TV Antenna System in your building. Call us now for a free quote, or just call us for some advice. 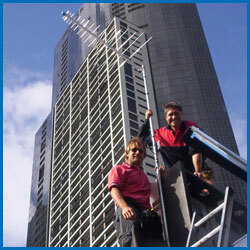 Digital TV Signal for Brisbane is transmitted from Mt. Coot-tha. There is also a recently installed Repeater near Ormeau on the Darlington Range servicing Reception Blackspots. Fast Response Digital has all the necessary Antennas and Antenna Hardware to get the absolute best Digital Reception into your house. We have tackled some of the hardest areas in Upper Mount Gravatt, Cornubia, Shailer Park and Inner City. Many Brisbane Households that we have visited were once having a terrible experience with their Digital TV Reception. By carefully assessing the job and performing a comprehensive Digital Signal Test on their roofs, we have been able to find the right solution and achieve great results. Recent Installations of 4G Phone Towers around Brisbane have been causing interference. In many cases, reception is lost completely when the Phone Tower is activated. We have the latest products to eliminate 4G Interference. Even in some of the better Digital Reception areas of Brisbane, we have encountered many people with Reception problems–areas like Acacia Ridge, Mansfield, Underwood, and Springwood, where generally, not much is required to achieve Crystal Clear Digital Reception. Throughout the Logan Area we have been able to leave people with the best in Digital TV Reception. There are some great new products on the market for Digital TV Reception. Most of the products we use are made in Australia. Quite often we can pull down old monsters of Antennas and Masts, installing a new compact Australian Made Digital Antenna, leaving people with Perfect Digital Reception. There is no need to despair if that Digital Television is letting you down. Give Tuned In a call. Tuned In has also been working on some of the older multi-story buildings of Brisbane. From two and three story Unit Buildings through to Multi-story buildings closer to the city, we have achieved some great results. From Coorparoo and Greenslopes right into Fortitude Valley, we have been getting Digital Reception into properties and venues. The challenge in some of these buildings is to install new RG6 Quadshield Cabling to every TV Outlet. Call Fast Response Digital for a free on-site assessment. Tuned In Cabling Solutions can diagnose any of your TV reception issues and provide the best solution. We fix problems the first time! 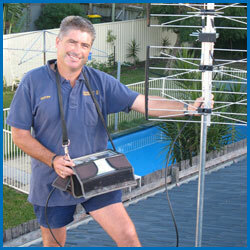 • New Digital Antennas – Houses, Units, Sheds—ANYWHERE! • Assessment & Solutions for all Commercial Applications; Offices, Factories etc. WE OFFER AN EXTENSIVE WARRANTY OF UP TO 5 YEARS AND PROUDLY SUPPLY AFTER SALES SERVICE AND FULL SUPPORT. At Tuned In Cabling we can install extra outlets in any room or location for any application. • Extra TV outlets. Need some outlets in the kids rooms or outside in the patio, give us a call. • Additional Pay TV outlets, or relocation of existing outlets. • Additional Phone, Data & Networking Outlets. We are fully licensed for phone and data work. All work is performed to the highest of standards. We test our work upon completion, and make sure that all outlets are performing to the optimum. Call us now to make an enquiry! At Tuned In we can install your new home theatre system and more importantly ensure that it is installed to maximise sound output, visual quality and performance. We can also establish internet solutions so that you can readily access and use your Smart Home Technology. Tuned In can help you access Streaming Services, Freeview and apps. Not to mention Tuned In provides each customer full instruction and demonstration on how to use it to its full potential. Just bought a new Television for the lounge area or the bedroom, and want it installed professionally and neatly? 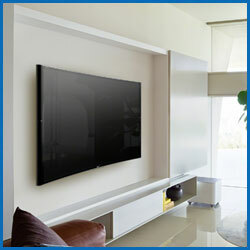 Let Tuned In install your new flat-screen television, and ensure that it is set up to its full potential. Whether it’s a new Smart LED or the latest Curve Television, we can help you. 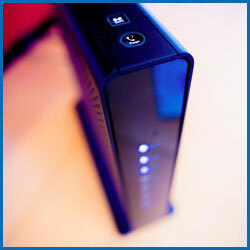 We can also help with internet access for your Smart TV. Tuned In can also connect all of your existing and new components to your TV, including; DVD, BLURAY, Pay TV & Home Theatre Systems. The experts at Tuned In will also adjust all of your picture settings and demonstrate how to best use you Television. We can Wall Mount your Television anywhere, and have a range of brackets that we can supply that will suit any application. 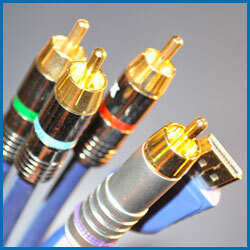 We carry an extensive range of the latest cables at great prices that can be installed if required. With every TV installed, we also offer the option of full Cable Concealment. Contact Tuned In Cabling Solutions for a free consultation or advice on the installation of your latest Television. Tuned In Cabling Solutions can provide Satellite Solutions. We have helped many homes that lie outside of Free To Air transmission areas with the installation of the Vast Satellite Service. • We can also do the jobs Foxtel won’t do. We can install Satellite Dishes where they won’t and run Cable where they can’t. 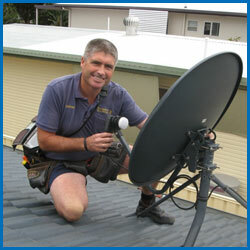 For any type of Satellite Installation, don’t hesitate to make an enquiry! Tuned In Cabling Solutions can diagnose any of your TV reception issues and provide the best solution. We fix problems the first time! All of our products are 4G friendly so you can avoid unwanted interference…Please Call us for a free Consultation!